There are hundreds of reasons that your electric bill could be high. Here are the top 7 that we see in the commercial marketplace. You can often solve these issues fairly quickly and with little expense. There are two basic parts of your electric bill, as far as what you are paying for; supply (electrons) and delivery (poles and wires). All of us pay our delivery charge to the utility monopoly - that is just the best way to date of paying to maintain the safety and consistent supply of energy. This is usually about half of your overall costs, and is billed in a complicated formula that we estimate around $.06 per kWh for commercial. We are also a deregulated state, meaning that you have the option to purchase the supply from someone other than the utility monopoly. There are a ton of electricity providers in the state, and there are brokers that sell and provide this. This cost is usually about $.06 as well for commercial, and rarely do alternative providers provide a much better deal (other than airline miles if you switch). More often than not, we find that our clients are hurt from purchasing their electricity from someone other than Comed or Ameren. If you currently purchase from a third party provide, check to make sure your rate is competitive. Often, these companies will offer a competitive rate locked in for a certain time period, and then raise the rates when you are out of the introductory period. Check with your local utility to see if their rate is lower, and if it is, consider switching back. If you would like to shop around, we recommend checking out Choose Energy or another online comparison tool. You can see the prices that multiple companies offer at once. Try to lock in for a long time period, as the shorter periods of time have better rates and then go up significantly. We rarely advise for someone to switch energy providers, as we believe the emphasis should be on lower your usage, and not driving the cost down in what you pay per kWh. The only customers we have seen that win at that game are huge companies that use a ton of energy - smaller companies are more likely to get taken advantage of and you have better things to do than watch your energy rate monthly. This is rare, but it is a real thing. When our utility went through a major modernization, they have installed smart meters throughout the area. Someone has to enter this information of a meter into a computer database, and occasionally, they make a mistake. This actually happened at my sisters house in Indiana. Her bills were incredibly high in the winter around the holidays, and her neighbors were huge holiday light fans. It took a lot of detective work, but we found eventually that she had been billed for her neighbors usage instead. Someone accidentally swapped their meter numbers when entering them into the master database years ago, and she received a significant credit. I also had this happen in my first apartment. I had barely any usage in my place, was single, and worked as a firefighter and was gone for long time periods. My bills were close to $300 per month, and I repeatedly called the utility to as for their help. Finally, I turned all the breakers off in my apartment, and the meter was still spinning. 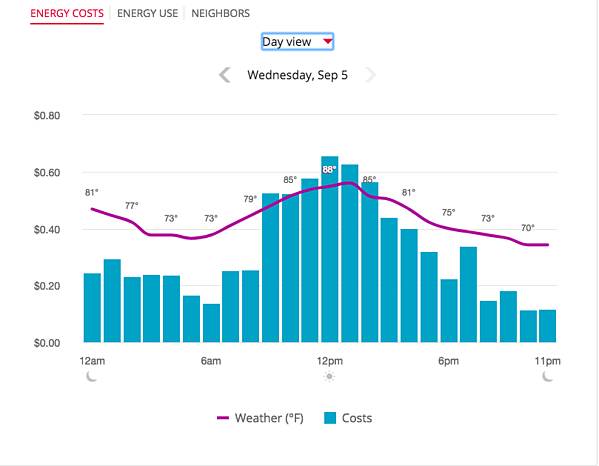 I noticed that the meter next to me was stopped, and at that point figured out that the neighbors across the hall (with the crazy amount of neon lights on all the time) were paying a tiny bill, while mine was astronomical. I always wondered if they got a huge bill after that was resolved, since I got a credit. Your meter usage can often be checked with an online tool that is available from your utility. You can login to your account and dig through data, which might help you notice if you are not being charged the correct bill. This is my actual home report from two days ago. You can look at the usage and see if the pattern matches your business hours. You can also look at your meter number on your bill, to make sure it matches your physical meter numbers. It may not be practical, but another trick is to turn your breakers all completely off. If your meter is still spinning, there is something wrong. Then it is time to call the utility and ask them to come out, although they will always drag their feet and are trained to tell you that you are incorrect. This is so common - it is hard not to notice how prevalent this is when you are in the energy efficiency industry. I notice this almost every day in the city, some business with exterior lights on all day long, or with a timer clock that is off from a time change and the outdoor lighting start or end at the incorrect time. Unless you are at Wrigley Field on a nationally televised day game and in charge of the television crew, there is literally no value to lights on during the day. And, in case the Rickets are reading this - LEDs would be a smart move for the best team in baseball. This is an easy solution with a $10 photocell. A photocell is a sensor that wires into your exterior light and stops the light from turning on during the day when there is enough ambient light. You can even creatively wire one photocell to many exterior lights, saving on the cost of the equipment needed, although this does increase the labor costs. I have seen parking lots for large strips malls that could literally save thousands of dollars each year with a simple $10 photocell. Most fixtures have a knockout in the side that allow for an easy installation and it only takes a few minutes. This is a common issue, and is not always very easy to address. There are times that you have a very clear need for light in your occupied business, and the lights need to be on so guests can see you are open and then can enjoy what your business offers. However, a ton of businesses are warehouses, manufacturing, or office space - and those do not need lights on for the full operational time. In fact, many warehouses have rows that rarely get occupied, and yet they leave the lights on all of the time from habit or inability to turn some lights off and leave others on. To take this a step further, it is rare that a business (even those with retail space that need to look inviting) are 100% set up to make sure lights are turned off when not necessary. Even bathrooms can use sensors, and they not only save energy but improve your customer and employee experience. Ten years ago, this problem was not easy or inexpensive to solve. Today, there is almost no reason that someone cannot use sensors in their business. The big game changer - LED lighting. Actually, its not the LED lights but the drivers that make occupancy sensors so powerful. These drivers and LED combinations can turn on and off instantly, unlike older fluorescent or HID lighting that takes time to start up. In addition, they can dim and put different levels of light output, often controlled by a smart phone or app. For this, we recommend Philips lighting and controls, as we have found they have the best drivers and easiest to use "commissioning" or scheduling of the controls. Finally, best practice is to group fixtures together, so you don't have the experience of walking into a storage room and getting the disco ball affect of lighting coming on one at a time. Sensors and lighting controls can be grouped together to respond together, creating a more smooth experience that saves energy and still makes safety and employee experience a priority. For those of you in Illinois (and those outside again are welcome to come join us), you benefit from one of the greatest energy efficiency programs in the country for businesses. 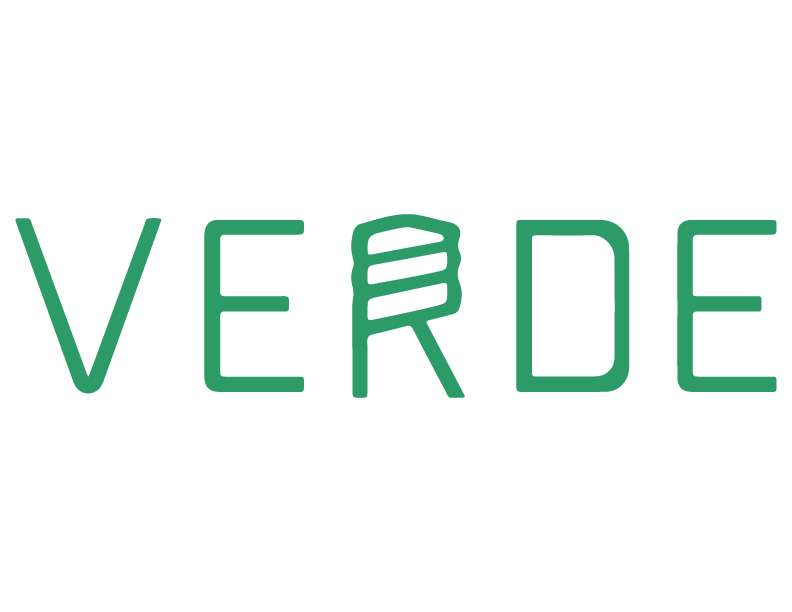 You can get incentives as high as $75 for a wall mounted occupancy sensor in a wall plate, or $50 per fixtures in an office or exterior lighting sensor. Those are incentives that you pay into, and can decrease the cost significantly in solving this common challenge. In addition to saving energy, sensors can prolong the life of equipment, decreasing your future replacement costs. You cannot talk about high energy costs and not talk about heating and cooling. 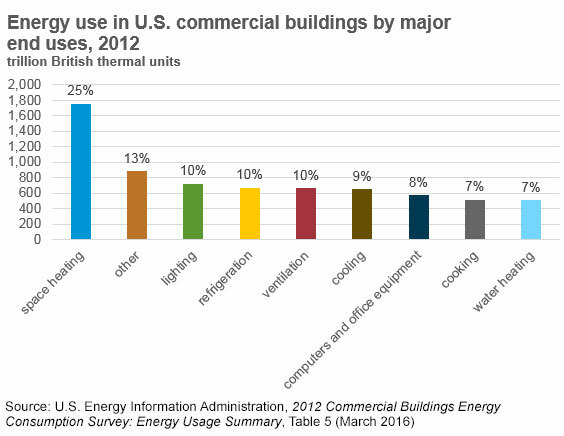 As you can see from the graphic below, heating, cooling and ventillation costs take up 44% of the overall energy usage of commercial space. You cannot take a dent out of your overall energy usage without considering your HVAC systems. The easiest way to approach saving energy is to replace your existing thermostat with a smart thermostat. 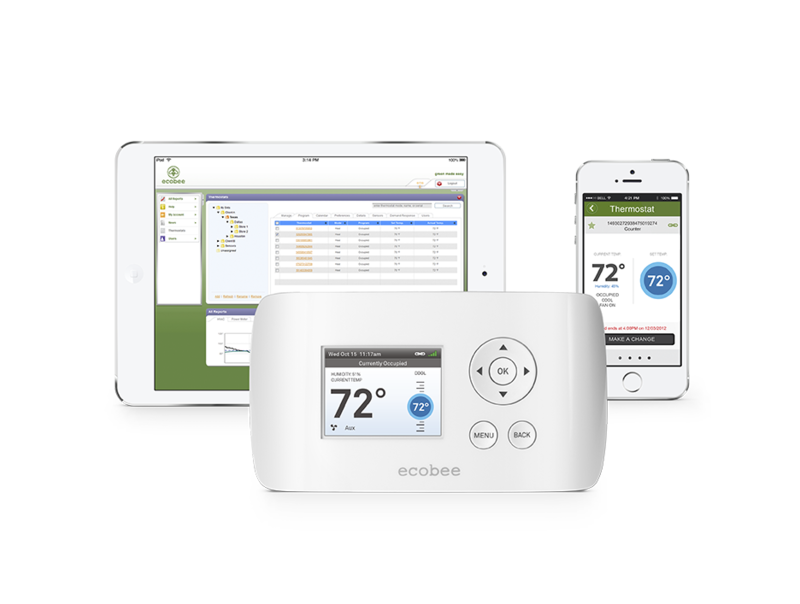 We recommend the Ecobee EMS-Si for commercial customers, as they seem to have the most robust thermostat for multistage heating and cooling often found in commercial spaces. They also have a solution for the common c-wire issue, along with a fairly straight forward platform that can track multiple smart thermostat locations at once. Smart thermostats are simple - they are a fancy programmable thermostat that can be controlled from your smartphone and can use technology to push your energy savings by setting back temperatures when your space is unoccupied. Closed for Labor Day - your smart thermostat will notice your smart phone is not in the building and also that motion sensors in the unit are not being triggered, and will save you additional money by not cooling that space. If you have already installed a smart thermostat, it is time to think about replacing your commercial heating and cooling unit. We recommend cooling unit replacements to a CEE Tier 2 energy efficient unit, as the theoretical savings on cooling are much higher than heat savings (at least on rooftop units or RTU). It is really difficult (but not impossible) to get above 80% efficient rooftop RTUs, at least at the current technologies. Fortunately, gas prices are relatively inexpensive in Illinois. In addition to saving energy, they also are a huge source of potential future maintenance costs. Units today only typically get 10 years out of them, so anything longer than that is a matter of time before it needs serious maintenance or replacement. Taking a proactive approach and replacing the unit before it crashes is called an early rooftop unit replacement strategy, and can lead to incredible Return on Investments when you consider the alternative reactive strategy. When you react to a unit that goes down, you will never have the lead time to get an efficient model, and rarely does this happen in the time of year that you can be without heating or cooling. Finally, newer units often come equipped with economizers, which are designed to bring in fresh air when it is cooler or hotter outside. Restaurants are especially a good target for this type of equipment, although all businesses can benefit from it (since humans are little heat engines and kick off a lot of CO2). I can't tell you the number of times I have been on a restaurant rooftop in November when the AC compressor is running, whereas an economizer would just open up and bring in fresh air to cool off the kitchen. Computers are often left running in an office, sometimes out of necessity, but more often just out of laziness. Computers do not use a ton of energy these days, especially with smaller and more efficient screens. However, they will often have a lot of accessories linked to them that can cause phantom power draw (its a thing! ), like phones, speakers, and additional monitors. Smart power strips cut power when the primary energy user is not drawing a certain wattage. This device does not save a ton of energy, but it provides the added value of protecting your equipment. We recommend this to all of our commercial customers, especially if utility incentives cover the cost. Screensavers are so 2001, so make sure to put your computer to sleep (or at least the display). Servers are at times a necessary evil for many institutions. However, those institutions are shrinking, as cloud based servers are so inexpensive and safe. Servers create a lot of heat, and are best housed in cool climates with cheap energy. Since huge energy users pay less for electricity - server farms get great rates and can locate in places close to wind farms and hydroelectric sources of energy production. If it is 2018 and you have not gone to a cloud-based server, please do so for your own sanity. Servers are a lot of headaches to maintain, and there are so many inexpensive options that it is worth shopping around. Save the heat, headaches, and high energy costs of servers.